Clients | Ashford Cleaning Contractors Ltd.
Why use Ashford Cleaning Contractors? Don?t just take our word for it? Over our many years in business we have built up a wide client base that come back to us time after time, they appreciate our quality service and impeccable attention to detail in everything that we undertake. ?McArthurGlen have been working with Ashford Cleaning Contractors for many years, during this time they have always provided a first class service. They have become an integral part of our team and work with us to help us achieve the consistently high standards that we demand. I would have no hesitation recommending Ashford Cleaning Contractors to anyone seeking a reliable and efficient cleaning service.? Ian Cowell – McArthurGlen (UK) Ltd Facilities Manager. ?During our association we have found the directors very pro-active, the management staff have a very close relationship with the on-site supervisors as well as a formal procedure concerning assessment and management. This period of longevity is rather unusual but does indicate the standards set by the company directors and expectations by the clients have been delivered. We are, therefore, able to commend the company to national organisations as well as individual enterprises.? Hugh Summerfield – Finn -Kelsey & Chapman. ?Ashford Cleaning Contractors Limited have been cleaning the Ashford Market complex for 30 years and throughout that time the service has been excellent, reliable and efficient. 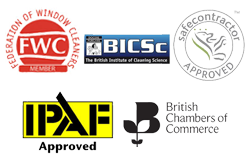 Hobbs Parker, together with the Ashford Cattle Market Company Ltd would therefore have no hesitation in recommending Ashford Cleaning Contractors Limited for any cleaning job required, no matter how large or small.? Pam Ackfield – Hobbs Parker Office Manager. ?I would like to take this opportunity to thank both you and your staff for the professional services which Ashford Cleaning Contractors Limited consistently provide. I am extremely satisfied by the quality and standard of work carried out at Kent House. I have no hesitation in recommending your company in the future.? Joan Samuels – Senior Building Manager, Kent House.